The Pink-Headed Duck, or Rhodonessa caryophyllacea, is a duck that once called the range of India, Bangladesh, and Myanmar home (and quite possibly still does). 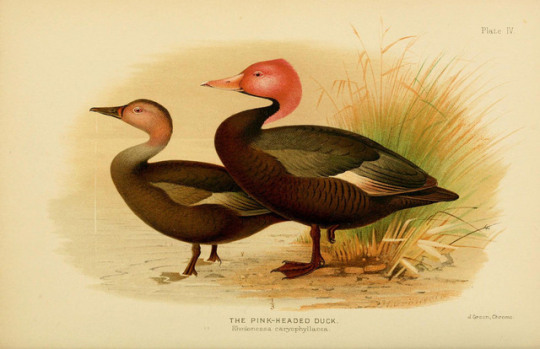 The reason that many believe the Pink-Headed duck is extinct though, is that nobody has gotten verifiable proof that they still exist since June 1935 when what was thought to be the last wild specimen was unknowingly shot in India by C.M. Inglis, although reported (unverifiable) sightings carried well into the early 1960’s. From within the mountain pools, three extremely large and unsightly creatures that resembled giant toads, rose up from beneath the water and started swimming towards the waters edge. The same edge where the scientists were currently setting up their recording equipment.